It is 2019. And here we are still wearing that righteous gospel that was James Baldwin's "The Fire Next Time", a clarion call of that foreshadowed the political and economical landscape of today. It was "Notes of Native Son" that demanded we engage who we are and whose we are. That alone is the reason we come together in 2019 to uphold the momentous mind and heart of James Arthur Baldwin. 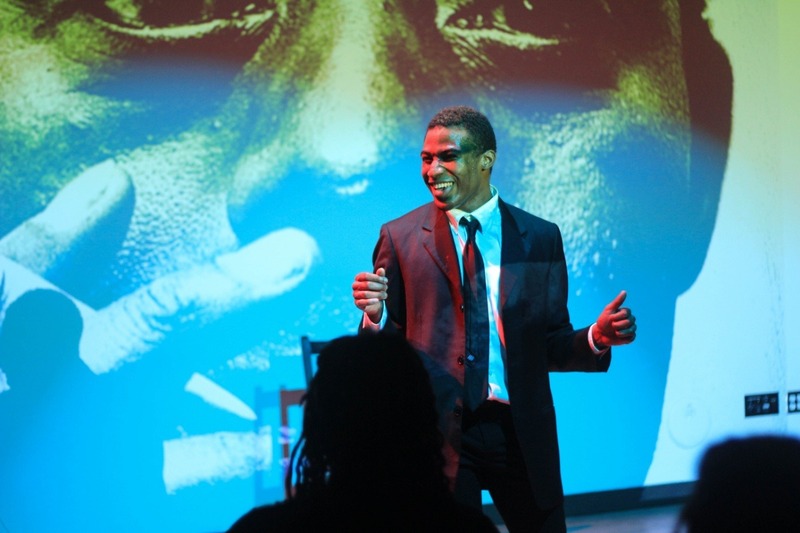 "They Do Not Know Harlem: In Communion with James Baldwin" is piece that time travels through song, dance and spiritual works that ask us all to assess and bring to light those things of the past and the present that define (or don't) our collective and individual directions with the wisdom and fervor of Baldwin's voice. Fall 2018 this project began as a thesis for my Movement for the Actor (DRAMA 728) course under the instruction of Professor and Movement Coach Tracy Bersley. Gradually members and artists of the Triangle community slowly and surely became involved i.e. Brentton Harrison (Sound Designer), Caique Vidal (Percussionist) and Sinclair Palmer (Bassist). December 2018, I had the honor of presenting an excerpt of the piece at Slippage Lab at Duke University with the guidance and direction of mentor and professor Thomas DeFrantz. I am currently gearing for a 2-night residency at Thomas DeFrantz's Slippage Lab at Rubenstein Arts Center at Duke University with the help of lighting designer/projectionist, Lisa Suzanne, drummer/vocalist, Aarik Duncan, sound designer, Brentton Harrison and director Kathryn Hunter-Williams that occurs May 10th-11th! This piece began as a thesis and is now taking its absolute wings and with the financial support of my community it will fly. We are looking to fundraise a total of $2,500. This will compensate the four collaborators for their creative labor and erudite efforts ($625 per person). The goal is to raise the $2,500 in time for the staged workshop taking place April 27 that is a joint collaboration with Unforgotten Media at Walltown Studio Theatre Historic Black Neighborhood of Walltown. Join us there, donate or both! I thank you in advance for the mighty, mighty love and monetary contribution. It is warmly and mightily embraced! My team - Unforgotten Media - and I are seeing to the vision that we may never forget the profundity of Baldwin's artistry. It is necessary to continue to redefine the way that Baldwin impacts this new generation of artists so as to explore the relevance and how we all embody his work, his words and his legacy. The clarity in his prose. The sharpness of his intellect. We speak his name more than ever because the need is greater. We dance. We sing. We then go tell it on the mountain! We love you deep, deep.